Ten days into the 2012-13 QMJHL season, the Quebec Remparts are already where most experts and junior hockey fans expected them to be: at the top of the overall standings. Through four games, Patrick Roy’s team has been dominant going 4-0, while scoring 23 goals and allowing a mere 6 goals. 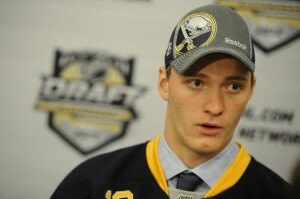 Yesterday, Buffalo Sabres’ draft pick Mikhail Grigorenko set up three of his club’s goals as the Remparts came from behind to defeat the visiting Val-d’Or Foreurs 4-2 at the Old Colisee in Quebec City. The 2012 first-round draft selection has had a multi-point performance in every game this season and now has three goals and eight goals for eleven points in four contests. Francois Brassard only had to stop 15 shots to record his fourth win of the season for the red devils. After four games, Brassard has a great 1.50 GAA with a stellar .938 save percentage. The 18 year-old netminder was a sixth-round draft pick of the Ottawa Senators in 2012. Quebec continued its success with the power play, going 3-for-6 in the game, and currently leads the QMJHL with a 47.6 per cent scoring efficiency on the man advantage. Grigorenko only trails undrafted forward Jean-Sebastien Dea in the scoring race. Dea has recorded nine goals and four assists for thirteen points in five games with the Rouyn-Noranda Huskies. Undrafted gem, Zach O’Brien, of the Acadie-Bathurst Titan is ranked third with five goals and five assists for ten points in five matches. Other notables include Florida Panthers’ Jonathan Huberdeau with eight points in five games with the Saint John Sea Dogs as well as Montreal Canadiens prospect Charles Hudon, who has notched nine points in four games (he missed one game due to an ankle injury). As for the best prospects who will be eligible at the 2013 NHL Entry Draft next June, Jonathan Drouin (HFX) leads the way with eight points in four games, followed by Nathan MacKinnon (HFX) (ranked #1 on Bob MacKenzie’s Top Prospect list) with six points in four games, Adam Erne (QC) with six points in four games and Anthony Duclair (QC) with five points in four games. On the other end of the spectrum we find the expansion team, the Sherbrooke Phoenix, with a 0-5 record and a -23 goal differential (4 GF and 27 GA). The season will be long in the Eastern Townships as the club lacks depth and talent in its newly-formed line-up. First overall draft pick, Daniel Audette, Donald Audette’s son, is off to a dismal start, recording zero point in five games along with a -9 rating and ten penalty minutes. Other teams who are having a strong start: Saint John Sea Dogs (4-1), Rouyn-Noranda Huskies (4-1), as well as Blainville-Boisbriand (3-0-1) and Rimouski Oceanic (3-0-1). Come back every week for a round-up of the action in the QMJHL! Follow me on Twitter for more updates on the QMJHL and hockey in general.